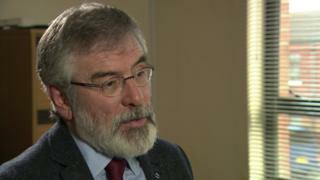 Sinn Féin leader Gerry Adams has said party colleague Martin McGuinness is "very resilient", hoping he will be back to full health "before too long". On Monday, Mr McGuinness resigned as NI deputy first minister over the handling of a botched energy scheme that could cost taxpayers £490m. The move is likely to lead to a snap election. Mr Adams said Mr McGuinness was "obviously ill", saying many people had been shocked by his appearance. Sinn Féin has not disclosed details of the illness, but it has been reported by RTÉ that he has a rare heart condition. Mr McGuinness on Monday denied that his decision to quit had anything to do with health problems. "I myself have received many messages from former combatants, from former RUC people, from the Protestant community, all saying give our best wishes to Martin," said Mr Adams. In a tweet, Mr McGuinness said: "I deeply appreciate the thousands of messages of support & good wishes that I and my family have received since yesterday." Mr Adams, who represents Louth in the Irish parliament, was asked if he would return to Northern Ireland should Mr McGuinness step aside from politics. "I don't contemplate coming back and standing as an MLA," he said. "I represent the people of Louth, I'm part of the national leadership. "We've a very important election here to fight, we will have negotiations, I'll play my full role - hopefully with Martin McGuinness." Mr Adams also said a return to direct rule for Northern Ireland "cannot be an option". Mr McGuinness cited the Democratic Unionist Party's (DUP) conduct over the Renewable Heat Incentive (RHI) scheme scandal as the main reason for his resignation.